Columbia 300 created the Scout Reactive Bowling Ball for entry-level bowlers to use on drier lanes. Utilizing the original 3 piece pancake core technology, Columbia surrounds it with a reactive veneer coverstock that is polished to provide length through the heads, and dependable reaction on drier lanes. Columbia 300 provides multiple color schemes to offer choices for the differing tastes of their bowlers. Start bowling with a Columbia 300 Scout Reactive Bowling Ball today! By Dave back-swing from Alameda, Ca. when the lanes start breaking down if you want a strong, straight ball that will give you strikes this ball is it! Hello Angie. The ball will not be pre drilled unless you purchase drilling through bowling.com, otherwise you will take it to your local driller to have it drilled. How much does the ball break? This ball will have a minimal late break. does this ball react too soon? Hello Ryan! This ball will have a skid/flip reaction and it will have minimal break with a slight hook. 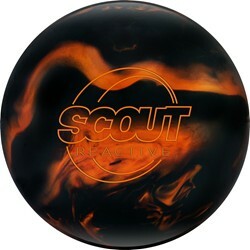 Due to the time it takes to produce the Columbia Scout/R Tiger's Eye ball it will ship in immediately. We cannot ship this ball outside the United States.